Our employees are our most valuable asset as they are keenly aware of our customers’ needs. Understanding this, the Shellenberger Family Companies continuously strive to meet and exceed those needs. We offer several automated methodologies and interfaces so that customers can track loads and obtain the information and service they require. We are continually evaluating new technologies as they emerge in order to continuously improve our responsiveness and timeliness. Click on the Lanes Map tab above to learn about our primary inbound and outbound coverage. We service many lanes routinely and several others on an adhoc or as needed basis with the ultimate goal of satisfying and exceeding the needs of our customers. To request information, please click on the Rate/POD button to send an email identifying your request. We will respond as soon as possible. 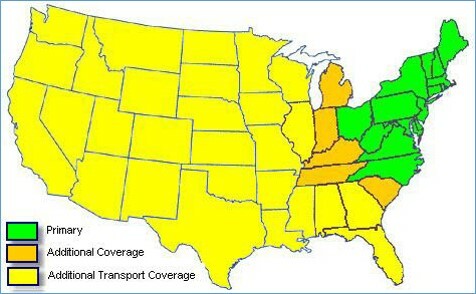 Our Primary Outbound Lanes, mainly service the Northeast, Southeast, and Midwest regions from Central PA.
Our Primary Inbound Lanes, mainly ship from Northeast, Southeast, Southwest, and Midwest regions into Central PA and surrounding areas.